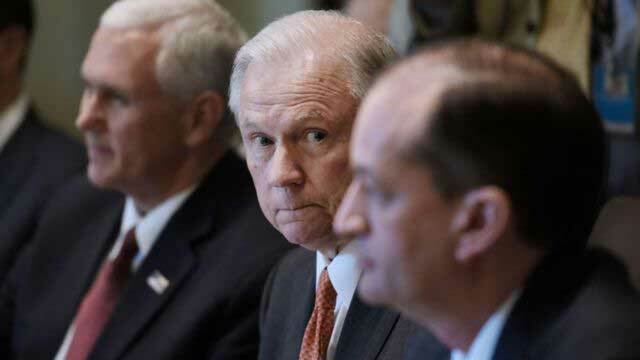 Washington, Jan 23 (Just News): Attorney General Jeff Sessions was questioned for several hours last week by special counsel Robert Mueller's office as part of the investigation into Russia's meddling in the election and whether President Donald Trump obstructed justice since taking office, a source close to Sessions told CNN. The interview, a major development in Mueller's investigation, took place last Wednesday. A source familiar with the discussion said it was the first time Sessions was interviewed and he was not under subpoena. Justice Department spokeswoman Sarah Isgur Flores confirmed the meeting, which was first reported by The New York Times. She declined to say if the attorney general turned over any documents or communications to Mueller's office. The White House said it is cooperating with Mueller's investigation and press secretary Sarah Sanders said she didn't know if Sessions and Trump discussed the interview on Monday when Sessions was at the White House. White House special counsel Ty Cobb did not immediately respond to a request for comment. According to CNN research, Sessions is the 15th member of the Trump administration, including former and current officials, who are known to have been interviewed in the Russia investigation. Last week, two people familiar with the process told CNN former White House chief strategist Steve Bannon has struck a deal with Mueller's team and will be interviewed by prosecutors instead of testifying before a grand jury. The sources did not say when the interview will take place or if the subpoena would be withdrawn. Sessions announced he would recuse himself from all matters relating to the Russia investigation in early March 2017. Politicians, including Republicans, praised the decision at the time, but Trump has publicly rebuked his attorney general and said he wished Sessions had not recused himself. Sessions' recusal left Justice Department oversight of the probe to Deputy Attorney General Rod Rosenstein, who appointed Mueller to be special counsel after Trump fired former FBI Director James Comey in May 2017.